Igor Bjelac is a parishioner at St. Barnabas, New Westminster. He is also a newcomer to Canada, arriving from Serbia in 2015. In this short film produced by the Government of Canada / Immigration, Refugees and Citizenship Canada through the Immigration Matters program we learn a little about Igor and his passion for fighting food waste and feeding the hungry. Murray asked those who view the video to share it, and to consider including the hashtag #ImmigrationMatters. Heritage Vancouver thinks of the building as Kitsilano Lutheran Church, because it was built and owned by the Lutherans through most of its life. Now City Life Church occupies the building. 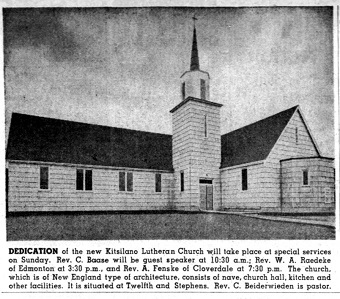 However the building is described, it will probably not be around much longer – and that makes it one more church lost to Kitsilano over the past few decades. 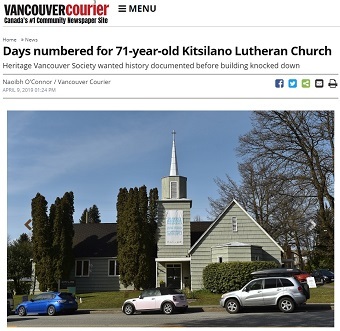 The history of Kitsilano Lutheran Church, which is going to be knocked down to make way for a townhouse development, won’t be evaluated or documented before it’s demolished despite a plea from Heritage Vancouver Society. At an April 2 public hearing, city council approved redevelopment plans for the property located at 2715 West 12th Ave. . . . Newspaper clipping from The Vancouver Sun, April 10, 1948 (from Heritage Vancouver letter). Heritage Vancouver, meanwhile, says the building is a prime example of immediate post-war church architecture in the city. Joseph Francis Watson and Harold Nelson Semmens designed it in 1947 for Kitsilano Lutheran Church. Watson served as president of the Architectural Institute of B.C. in 1945-46 and was a founder of UBC’s School of Architecture, while Semmens is credited with modernist works such as the Vancouver Public Library on Burrard Street and Hycroft Apartments at Granville and West 15th Avenue. Pastor Todd Lueck, shortly after City Life Church had moved in. “I had a friend,” Lueck says, “call me and say, ‘I came across this church building. It’s vacant. A developer has just purchased it. They’re going to be one to three years in the process of getting all the permits and considering what they’re going to build there. They’re looking for a tenant and they’re hoping for a church. You should look at it.’” . . . In January 2015 I noted in Vancouver’s lost churches that 20 churches had been alienated from the Christian community (demolished for housing or sold to other faith groups) over the previous quarter century. 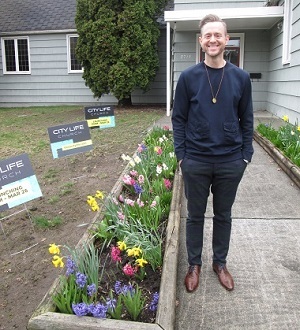 Five of those were in Kitsilano, and now another two are just about to disappear – Kitsilano Lutheran / City Life and St. Mark’s Anglican / Tenth Church Kitsilano, which I wrote about here. Housing is important, but we can’t afford to lose any more churches – especially in Kitsilano. Archbishop Michael Miller recently visited a church built by newcomers from the Middle East, offering a warm welcome. It’s not Roman, but it is Catholic. 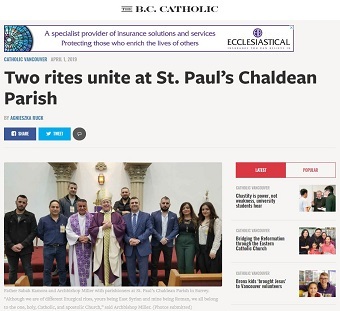 St. Paul’s Chaldean Parish in Surrey has its roots in the ancient East Syriac Rite, but the community is just as Catholic as the Roman Catholic Archdiocese of Vancouver. “Although we are of different liturgical rites, yours being East Syrian and mine being Roman, we all belong to the one, holy, Catholic and apostolic Church,” said Archbishop J. Michael Miller, CSB, while visiting St. Paul’s March 24. Archbishop Miller celebrated Mass with the community, about 1,000 families strong and largely populated by former refugees from Syria and Iraq. Many of the parishioners were sponsored to immigrate to Canada thanks to the archdiocese. “I wish to express my solidarity with all those who, in your lands of origin, have suffered from the fanatical hatred sown by terrorism, and caused so many of the faithful to leave the lands of their ancestors,” the archbishop said. “Sadly, such a situation caused the vital Christian presence to diminish in a land which witnessed the beginning of the journey of Abraham.” . . . The local Chaldean community was established as a Catholic mission in 2005. It held regular worship services in various borrowed parish spaces in Surrey until December 2017, when it was finally able to acquire its own church space. Village Church is now meeting at Cineplex Coquitlam (from Facebook page). Village Church added another campus to its rapidly growing family this month. 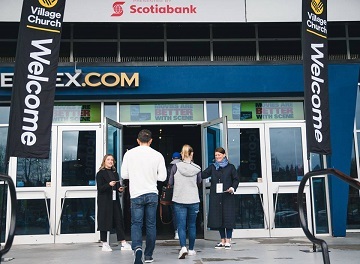 Village Church Coquitlam held its first service April 7 at Cineplex Coquitlam. Village Church, which began in 2009, describes itself as “one church that gathers in multiple locations.” So far, that means several thousand people attending 12 services in Surrey, where they began, along with north and south Langley, Calgary and Coquitlam. In late 2009, Village Church was born in Surrey when Mark Clark preached to 16 people who were gathered in his house. Today, Clark’s sermons are heard by thousands every Sunday in Surrey and Langley and he is the lead pastor of one of the fastest growing churches in the country. The tale of how Village reached this point – at a time when many churches in Metro Vancouver are struggling – is almost as unlikely as how Clark became a pastor. . . .